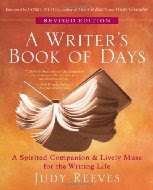 Last week I mentioned the book, A Writer’s Book of Days by Judy Reeves, that really resonated with me at this point in time. I have read numerous books on the writing process, both with regards to writing fiction as well as non-fiction, and while I have several that are high on my recommendation list, the prompts listed in those books intimidate me. It is as though they almost stifle my writing rather than foster it. I think I need to try writing with training wheels before I start riding the “big bike.” This book by Judy Reeves has given me those training wheels. I have strived to use these writing prompts every day this week and while I did not achieve that goal, I did manage to write 4 out of the 6 days and I refuse to beat myself up over the two missed days. Even in this short time of routine writing to a focused prompt, I have discovered a few things about myself the writer. There really isn’t a “right” way to respond to a prompt. For some reason I have been programmed since childhood (and most likely toddler-hood) that if you are going to do something, you should do it right. Consequently my left-brained dominant mind has taken that generality in life and applied it to everything. I still hear the whisper of “I don’t think this is the right way to do it” – but I am trying to silence that voice during these writing sessions and just allow the pen to write from the spontaneous images that come to my mind. Being a writer requires that the author be an observer – and being an observer requires that the author slow down and pay attention to the present. This is tough for me as I have come to realize that I have held EFFICIENCY as the top priority in my life for several years. I have always admired those who accomplish more than seems humanly possible. Superwoman should exist, in my mind, and I have tried to emulate this fictional character for far too long. My daytimer has been my lifeline – allowing me to keep track of all these tasks so that they are accomplished on time (or even early so that I can move on to the next task). I look for ways to add more minutes to my day – not so that I can relax but so that I can do more. But oh….what have I missed in all this running around? And quite honestly, what have I accomplished at the expense of missing the little things in life? I need to learn to slow down – to enjoy the moment – to look closely at nature and meditate on the simple pleasures of life, which definitely do not include all those multi-tasks on my to-do list. If I allow myself to write long enough to follow the bunny trails of my subconscious mind, I can be surprised at the clarity it brings to life. I must confess that this does not happen each day, but there is a element of mental cleansing that does feel refreshing at the end of each session. Yesterday, however, I actually had an epiphany. The prompt was simply “Life’s Simple Pleasures” and I immediately started writing about reading, which led to shopping at bookstores. I wrote quite a while on this – detailing the different interests I have cultivated over the past two years while reading blogs and browsing the shelves. One of those interests included photography – which led to another simple pleasure in my life which is scrapbooking and card making. In this moment of writing I bemoaned the fact that not only do I not have enough time to engage in these activities – but I really have no reason to make a card – to whom would I send it? And then it dawned on me — my mother!!! I have experienced such guilt not calling her or visiting her as much as I think I “should” …. BUT….my mom LOVES mail – I mean, she lives for the noon hour when she can go to the mailbox. If there is anyone who would appreciate a card, it would be my mother. Why have I not thought of marrying these two activities before? I have no idea, but I am certain that I would not have developed this combination on my own; it was only through allowing the subconscious to guide the pen that led to this discovery. So today I am going to make a card – or perhaps more. Today I am going to enjoy the process of making the card, rather than rush to complete the task so that I can move on to the next one on the list. Today I am going to write again and see where the pen takes me. Today I am going to practice living in the present. From one who was fooled by the superwoman myth to another, good for you!! I love the living in the present philosophy and most of all, caring for yourself. You can care for yourself and also care for others. I think your card plan is brilliant! Molly, I always love the writing books you post about on your blog. I'm reading a book right now called Poemcrazy that sounds similar to this. It has the best no-pressure prompts. I guess you could say it's the training wheels book for poetry writing. I loved this post! Amen, sister! I am always trying to do more, more, more. This year I am teaching creative writing, and we do in-class writing exercises, including freewriting and writing to prompts, for about half the class. The students report that writing relaxes them, and the room is completely hushed while we write. I write with them, and this daily practice really helps calm me down. Oh, what a great post! I especially love the part about slowing down and enjoying the simple pleasures of life. One of my favorite simple pleasures is taking a book to an outside area of a mall, and while reading (or pretending to read), observe the people going by and noticing their behavior, their interactions, etc. This activity used to embarrass my kids when they were teens, but I assured them that I do this all very surreptitiously. Yeah, sure I do! But most people that I watch are so caught up in what they're doing, that they don't notice me noticing them. I sort of fell into this habit when I was a social worker. One of my supervisors in the early years said that "social workers have a license to stare." I think the same could be said about writers. An enlightening post, Molly. I find when I write and especially when I journal I find out more and more things out about myself. Enjoying the moments of life takes practice, so, be kind to yourself in the process. Looks like you're giving yourself permission to write in a way that works for you. Great, great, great post! I have to constantly remind myself to slow down and enjoy the moment. Though my schedule will be a busy one, this is what my 2011 will be about…enjoying the journey. Great, great, great post! Looks like you're giving yourself permission to write in a way that works for you. I've always wanted to write and the Omaha Lit Fest just really kicked that up a notch. I think I'll have to pick this one up to help with that process. At the rate I'm going, if I ever succeed, I'll be the Grandma Moses of literature! #2 sounds just like me. I'm working on learning to slow down and enjoy the simple things instead of being Superwoman all the time! I went over to Amazon and read as much as the book as was available for preview. (I couldn't stop reading!) It looks fantastic. I've ordered it for my shelf of every-expanding books on journals, travel journaling, and of course, just plain writing. Thanks for the recommendation. I think this is just the book I need to get a kick start, thank you for writing about it.